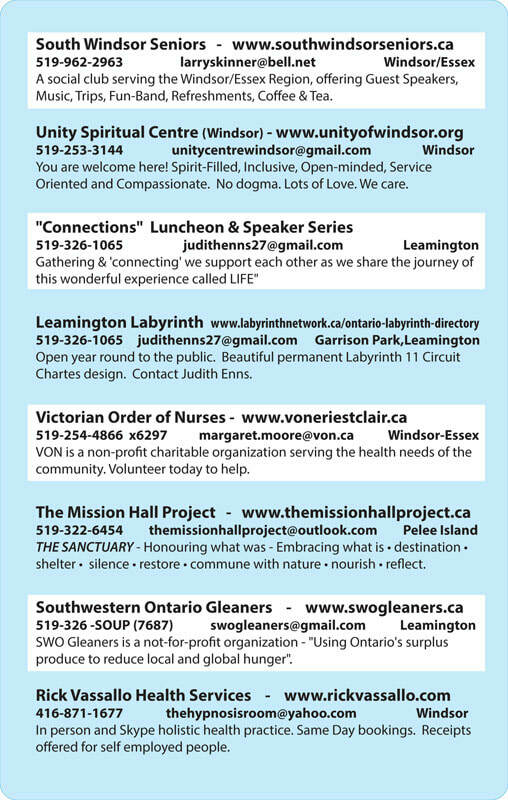 The Vibrational Energy Health & Wellness Directory has created a further advertising platform for community & charitable organizations that are bringing about improvement in a spiritual, holistic and/or wellness way to individuals, groups and neighbourhoods in the Windsor to Chatham area. ​*Please note that this ad space is only available to the following groups listed below - If you are a holistic or wellness business CLICK HERE to take you to the directory advertising information. Is your organization making a difference? Are you one of the following? If you are not sure whether what your ogranization fits into this category please email us at vibholisticdirectory (at) gmail.com with your information & status BEFORE proceeding. Brief description of your service (up to 18 words). *NOTE: Once you enter the information into the form, it will be published as is, so please double check your information as there won't be an opportunity to change it. PLEASE NOTE: that the 2019/2020 directory is now open!! ​Example below: Showing 8 lineage adverts on one page.